"Not as creepy as your face". The sass is real. This weekend I have suffered the consequences of getting up too early and getting little sleep. The consequences being sniffling and and sneezing all over the place, being stuck in bed and therefore having to bail on my friends at last minute (I am the worst for that.). I eventually dragged myself out of bed this morning to make the most of the day and somehow filmed a video plus took outfit photos and now I'm going to have to find a way to stuff fifty tissues in my skirt pocket all week. This is yet another outfit mixing monochrome with colour because this jumper is so cosy, I am fawning over it and the swirly pink pattern on the dress seemed to go with it so I was like "well that's what we're wearing this weekend". I don't know why I speak about myself in the plural form. Also, I am not climbing a tree in the fourth photo although I like to think I am so I'm carrying on my second useful catchphrase from this week. "Fake it until you make it". This involves me rambling to people in my class I've never spoken to before and pretending I don't want to run out of the room and hide in my locker. Second catchphrase has been "For *feathers* sake". First thing I say at the start of the day, last thing I say at the end of the day. It should really go on my TY hoodie at the end of the year. Also ! Speaking of school - TY Thursdays ! I was meaning to explain it to you in a post beforehand but then I made an impulsive decision to write the first post this week just gone so I'd have at least one example for my portfolio email ! In simpler words, we have to keep an account of our Transition Year experience - called as the 'portfolio' - in any form of media such as scrapbooks, memory boxes, blogs, videos diaries, etc. and I've decided to opt for what comes naturally to me - blogging ! So from now until May, expect a TY Thursday post either once a week or once every fortnight. 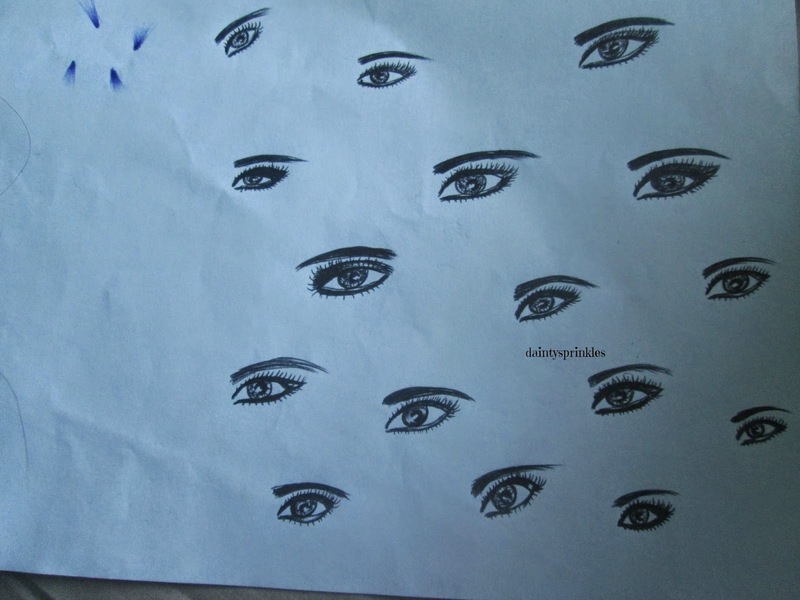 You can read about my first week here but when we're told to 'talk among ourselves' in class, I've taken to drawing eyes. Lots of them. The photo above is of most of the ones I've been drawing on one of the information sheets (minus the watermark obviously.) which are very useful when filling awkward silences because I just keep my head down and draw. They're supposed to look like the dramatic eye makeup from fashion weeks but I've mostly been told they look creepy and also that they resemble something that's either from a horror film // bright eyed. So I guess I should draw arms and legs off them to creep everyone out even more (s/o to my easily freaked out classmates. jk no.). In other news, I was in physio on Friday and it turns out I'm actually getting on well with the exercises and now I can stretch my leg up really high without it hurting. I actually feel like I've achieved something in life. Just in case I'm not on here before Wednesday, good look to anyone reading this who is finding out their Junior Cert results this week ! We'll all be grand because it's not the Leaving Cert and we get a day off school and don't have to wear uniform. Sorry if you're stressing out more than I am, that probably did not help. Either way I'm going to be in a pile on the floor laughing at some of my results like I told you on Thursday. Don't forget there's still eleven days to vote for Dainty Sprinkles' post on Positivity for Best Blog Post in the Blog Awards Ireland ! You can vote once a week here and as always, thank you so so much to everyone who's supported me by voting (and thank you x10000 to everyone who's shared the link !) I appreciate it more than you'll ever imagine ! Aww, it is always hard on your body when you don`t get enough sleep! I hope you are okay! Love the outfit.